On May 1st, 2012, L.A.-based hotel and restaurant developer sbe announced that they have secured $300 million to redo the Sahara, converting it to they're SLS brand. A total cost of $629 million is the estimate for the project. The hotel has been closed since May 16th, 2011 and, as of this writing, the only visible change is the removal of the wooptie-coaster-thingy. get more info on the reasons for the room-count drop, One of many possible scenarios is that the zero-view rooms in the 200-room, 14-story Tunis Tower might not be renovated, but that's just a guess. Based on the renderings, sbe will un-Morocconize the property and bring the towers back to their mid-century bones (thank the powers that be). The look is simple and elegant. Let's hope the finished product dazzles as much as the renderings. The balconies appear to be glassed-in in the model and renderings. My best guess is that the rooms will be enlarged using the balcony space. Still trying to contact sbe to get more info. "In recent years, the influx of ultra-luxury brands to the Strip began to limit the general consumer's accessibility to dining and entertainment diversions. With this in mind, sbe will create a guest experience at the SLS Las Vegas that is just as accessible as it is appealing. 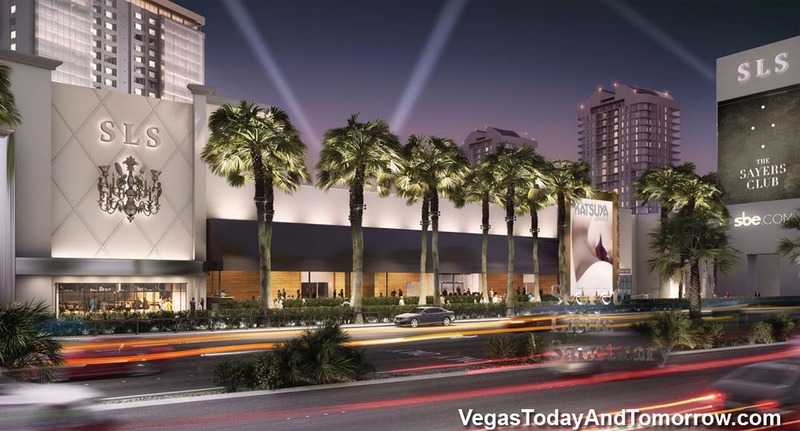 "We're seeing demand for a different experience – a refreshing, fun and accessible take on Vegas luxury – and the hospitality brands that we've developed over the years lend themselves very well to the classic timelessness that Vegas has always been known for," said Nazarian. "With SLS Las Vegas, we're bringing those brands to the Strip and creating a refreshing new experience that's designed for everyone." 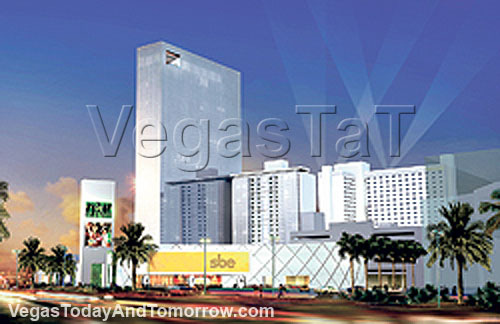 Once complete, SLS Las Vegas will feature an imaginative mix of sbe brands, including The Bazaar by Jose Andres, Katsuya by Starck, a reinvention of sbe's original nightlife concept, Shelter and new brands currently in development." As seen in the first rendering (right), the new tower (designed by Marnell Corrao Assoc.) will be adjacent to and north of the Alexandria Tower. All of the recently added Arabian themed adornments will be removed and a clean, modern resort will ensue. The entire property will be remodeled, including the rooms. Some of the public spaces have already been upgraded with carpet and wall coverings. Other completed (subtle) improvements include upgraded food items, menus and employee uniforms. There is talk that the Sahara name may be changed (I hope not). The resort will be positioned to cater to a younger crowd (similar to the Palms). 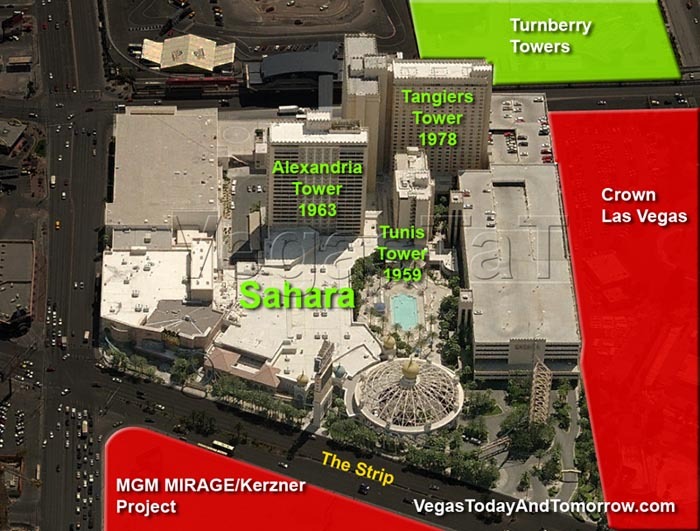 SBE has big plans for the aging Sahara and will not blow the place up to realize them (well the oldest tower will go). The plans include: a new 520-foot 1,000-room hotel tower, renovation of rooms within the Alexandria and Tangiers towers, demolition of the mid-rise 200-room Tunis tower, 92,300 square feet of new construction for the podium level, major renovations of the existing spaces, and a pedestrian realm along Las Vegas Boulevard. The new spaces combined with the refurbished spaces will bring the resort's totals to: 90,000 square feet of casino space, 56,900 square feet of retail, 78,900 square feet of restaurants, 19,000 square feet of entertainment venues, 32,600 square feet of meeting/convention space, 22,600 square feet of spa/fitness space, and 26,600 square feet of nightclubs. These plans went before the Clark County Planning Commission on 2/20/08 and have been approved. No renderings were available as of this report. With this remodel, I'm hoping to see the Sahara return to its mid-century-modern roots. In the 50's, this was a very chic two-story resort. Clean modern lines, limestone, no heavy theme, and an air of sophistication. 1959 brought the new Tunis Tower which was clean, simple and modern. 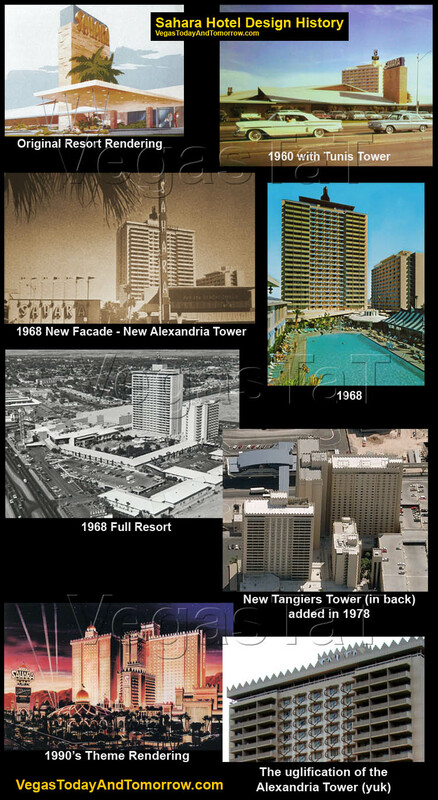 The beautiful, modern Alexandria Tower was added in 1963; at the time, it was Nevada's tallest building. In 1978 the simple, utilitarian Tangiers Tower was added to the back of the property. The tower was (is) not attractive by any stretch of one's imagination (the decision makers must have thought "hey, it's in the back, you can barely see it"). 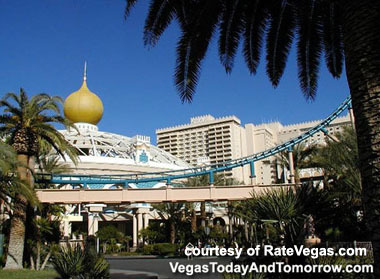 In the theme-riddled Las Vegas of the 90's, the Sahara suffered a horrific transformation into a harem-esque, jewel-laden monstrosity with a roller-coaster. Just about everything (inside and out) was "decorated". The Alexandria Tower received Arab-styled window coverings and its mid-century-modern roof-line was extended then adorned with more mid-east decor. They cheaped-out on Tangiers Tower, its window dressing was only a stenciled paint-job. Hopefully (with fingers crossed) the new owners will embrace the history of this old girl and treat her right with this renovation; there are a few clues that lead one to believe they will. One: their redesigned website uses vintage photos of the resort. Two: they are keeping the Alexandria Tower. Let's all pray they keep the name. A brief photo history (right) shows the changes. NEWS 8/2/07 SBE Entertainment officially took over ownership of the Sahara Las Vegas resort. SBE is partnering with Stockbridge Real Estate Funds and will operate the hotel and nongaming portions of the Sahara until SBE gets its gaming license. Meanwhile, the Navegante casino management group will run the casino. SBE plans to renovate the Sahara and its amenities through its hotel group and restaurant and nightclub group in the near future. No details were released. 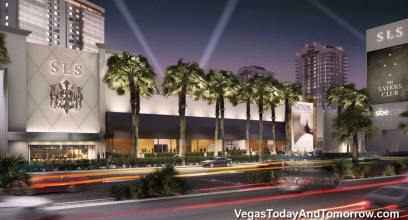 NEWS 4/20/07 MGM MIRAGE buys the big lot from Bennett...more on our MGM/MIRAGE page. 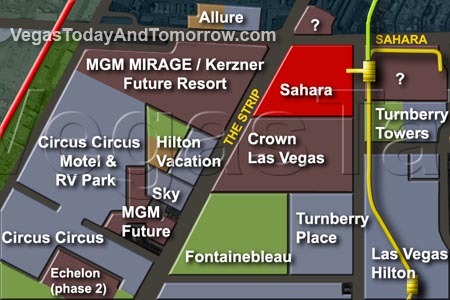 NEWS 3/3/07 The Sahara (the strip's northern anchor) has been purchased by Los Angeles-based SBE Entertainment Group for between $300 and $400 million. The purchase includes the resort and the 17.45 acres on which it sits. The remaining two parcels (to the west, across L V Blvd. and to the east, across Paradise) are still owned by the Bennett family and are not part of this deal. SBE Entertainment Group has lofty (yet undisclosed) renovation plans for the ol' lady. SBE will also take over the hotel and F&B management from the Bennett family. NEWS 8/21/05 The big-lot across the strip from the Sahara as well as the Sahara's occupied land and the large lot behind the Sahara (across Paradise Road) are all in play. A major (yet to be announced) developer is in negotiations for this combined 54 acres. The former Wet & Wild site may also be part of this plan as the Palace of the Sea development has been on hold long enough for me to move it to the Dreams page (too bad). The Wet & Wild site would add another 27 acres making this an 81-acre development (that's 15 acres larger than CityCenter) wow. Stay tuned for the latest on this.